Here in North America, General Motors and Detroit go together like hamburgers and French (ahem, Freedom) Fries or football and John Madden. It was with unwavering logic then, that when GM released a new sedan packing an oh-so-Red-White-and-Blue 6.2-liter V-8 and rear-wheel drive, most assumed it hailed from the mean streets of Motown. Not quite. As it turns out, the G8 GXP is from that continent-sized island known for Crocodile Dundee, Vegemite and, er, the world’s deadliest jellyfish. And spider. And probably marsupial. Ok, you get it. 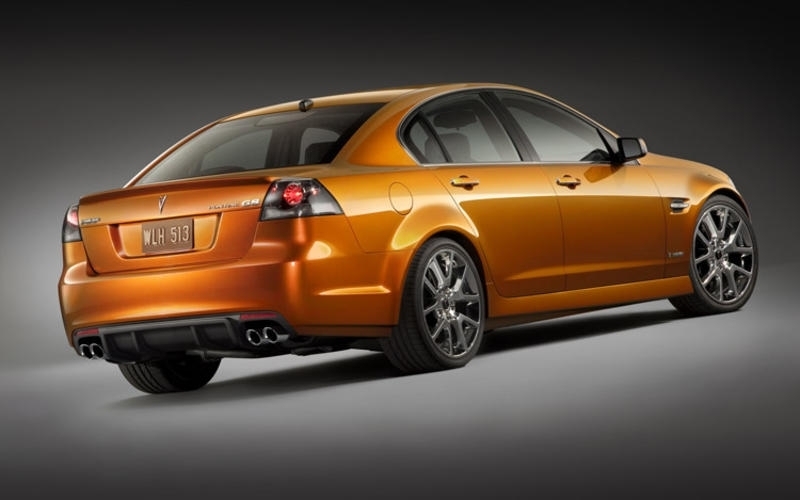 While it has been slightly re-skinned for Pontiac in North America, the G8 GXP begins its life as a Holden Commodore in Elizabeth, Australia before making the long journey across the Pacific. Much like the Australian language, it doesn’t lose much in translation. With its bombastic engine note, asphalt-churning burnout potential and industrial-grade gearshift, the GXP feels a lot like an American car, albeit minus the questionable interior plastics and oafish handling. You may have read some other road tests that likened the car to the last generation BMW M5, and we completely agree. Considering that, when new, the E39 M5 sold for $70k, it’s difficult to argue a case against this half-priced Aussie import. Xenophobes fear not, it has not gone without some American influence – you can still have one with chrome rims. The LS3 engine – which made its debut in the 2008 Corvette – is a force to be reckoned with, or in the case of the G8 GXP, enjoyed thoroughly. Sports seats provide plenty of lateral support but don’t leave you sore and bruised after long rides. A roomy interior makes hauling people and cargo an easy task. Tons of standard features and a tiny options list means buyers will get a lot for their money. Center console-mounted window controls we can live with, but when the side-view mirror controls accompany them, we have to draw the line. With an in-dash LCD display standard, sat nav would be a welcome option – but sadly it isn’t on the very brief options list. Unfortunately, fitting the G8 with the Corvette’s engine has brought with it an insatiable appetite for unleaded. At least its dietary inclinations remain American. A raucous throttle blip upon startup means anyone within earshot will instantly know you’ve got something special under the hood. Seated in the comfortable yet grippy sport seats, you’ll discover a steering wheel seems just a little bit too large, but all of the controls have a solid weighting to them. The chunky gearlever and talkative clutch go well with the serious nature of the V-8 engine. There is a curiously small amount of travel in the throttle, which certainly leads to crisp response but has the added effect of sometimes causing accidental explosions of acceleration when your brain and right foot suffer a slight miscommunication. Above 3,000 rpm the engine is absolutely rampant and – despite its substantial 6.2 liter displacement – encourages you keep the revs high. 19-inch wheels provide plenty of grip, and if you give it too much power traction it brakes predictably. If you’ve tried some of the harsher riding sports sedans, the G8’s suspension will surprise with its lack of rigidity, yet there is little body roll. 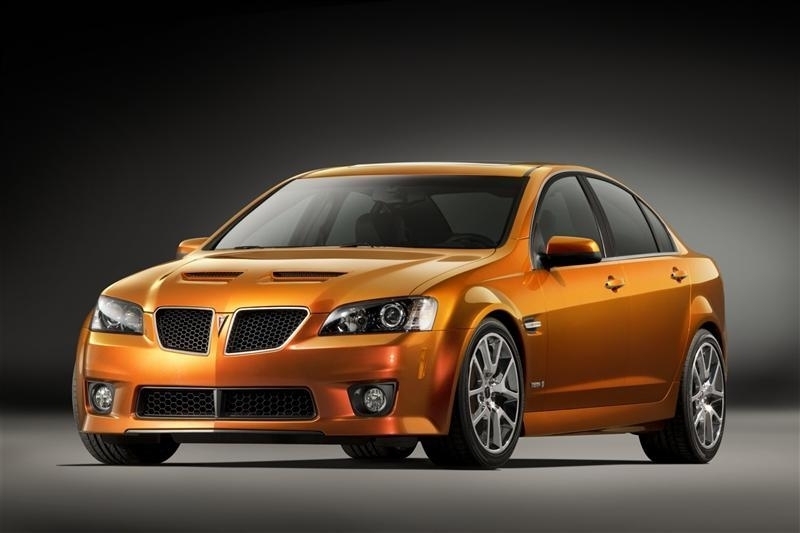 The G8 GXP is powered by a 6.2-liter LS3 V-8 engine with 415 horsepower and 415 lb-ft of torque. A six-speed automatic transmission comes standard, but to really exploit the car’s brute potential, opt for the heavy-shifting six-speed manual. 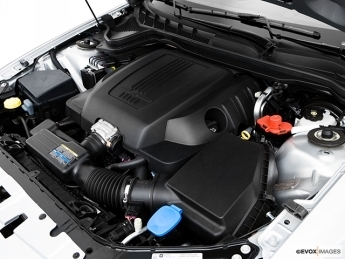 Power is driven through the rear wheels via a limited-slip differential. Options are sparse on the G8 GXP, amounting to the choice of summer tires in lieu of all-season items and a power sunroof. Front and rear interior dome lighting can be added at no additional cost. So basically, the thing comes loaded from the factory. Remind us again why there aren’t more cars like this? Standard equipment includes a somewhat tech-savvy 6.5-inch color LCD display for the stereo controls and a Blaupunkt 11-speaker sound system. Curiously, however, no navigation system is offered for the integrated screen. Dual-zone climate control, Bluetooth, satellite radio and power seats also come at no additional charge. If you consider yourself an advocate for the preservation of fossil fuels, go ahead and stop reading now. 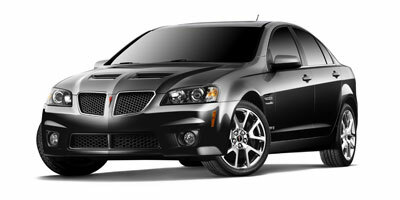 For the rest of you dreadfully awaiting the news, the G8 GXP returns 13 mpg city, 20 mpg highway. With the way it coaxes you to put your right foot down, don’t expect those numbers to improve. The G8 features a comfortable and suitably well-appointed interior that is devoid of the cheap plastics that typified Pontiacs of years past. An Audi-esque instrument cluster and in-dash LCD display add some modern appeal to the car. And performance seats that are actually comfortable? There’s a concept. We’re looking at you, Lexus IS-F. While its Australian brethren might come across as more intimidating, there is no denying that the G8 has a serious stance about it. GXP-specific details include a revised front fascia, 19-inch wheels and a few badges. With an MSRP of $37,610, the G8 GXP is no budget car. Or at least not at first glance. Once you look at the prices of similarly-abled cars such as the $54,850 BMW M3, $56,760 Lexus IS-F, $38,970 Dodge Charger SRT8 and $37,995 Ford Taurus SHO, you realize that it is in fact a bit of a high-horsepower bargain. With GM restructuring for a new post-bankruptcy future, Pontiac will soon be no more. 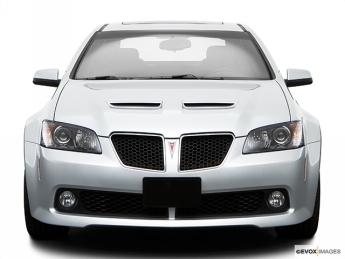 The G8 GXP then, is the ultimate swan song achievement, and a great way for Pontiac to go out on top. It’s a performance sedan of unbelievable ability and value, and those are words that rarely go together. Hopefully we’ll see it resurrected under another GM moniker so that its legacy may live on. If not, this could be a great collector’s car.